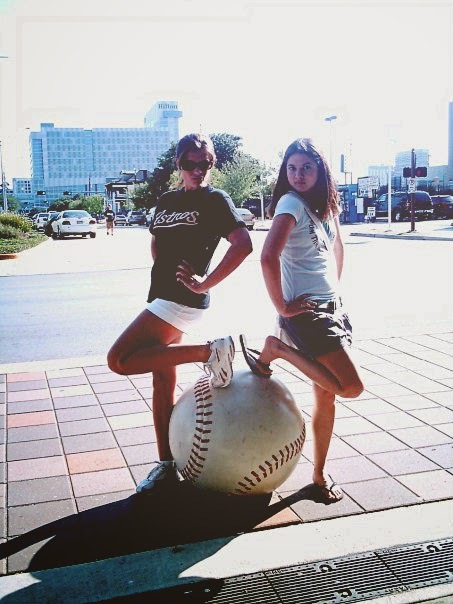 That photo is of me and my high school BFFL Erica before an Astros game. Based on the Reeboks I was wearing, you would justifiably think the year was 1984, but you would be mistaken as it was actually 2006 kids. I'm not a sporty person, per se (my father learned that the hard way when he bought me my first baseball glove at age 7 and discovered I couldn't throw or catch to save my life, when he took me to play tennis at age 10 and witnessed me screaming every time the ball came near me, and when after being the tallest person in my class with a "promising" (it wasn't) career in basketball ahead of me, all of a sudden I stopped growing at age 12 and have been stunted somewhere between 5'4" and 5'5" ever since), but I do enjoy the act of attending sporting events. Especially, Astros games, Especially when they're good. But beggars can't be choosers of course. And my all-time favorite pitcher Roy Oswalt. 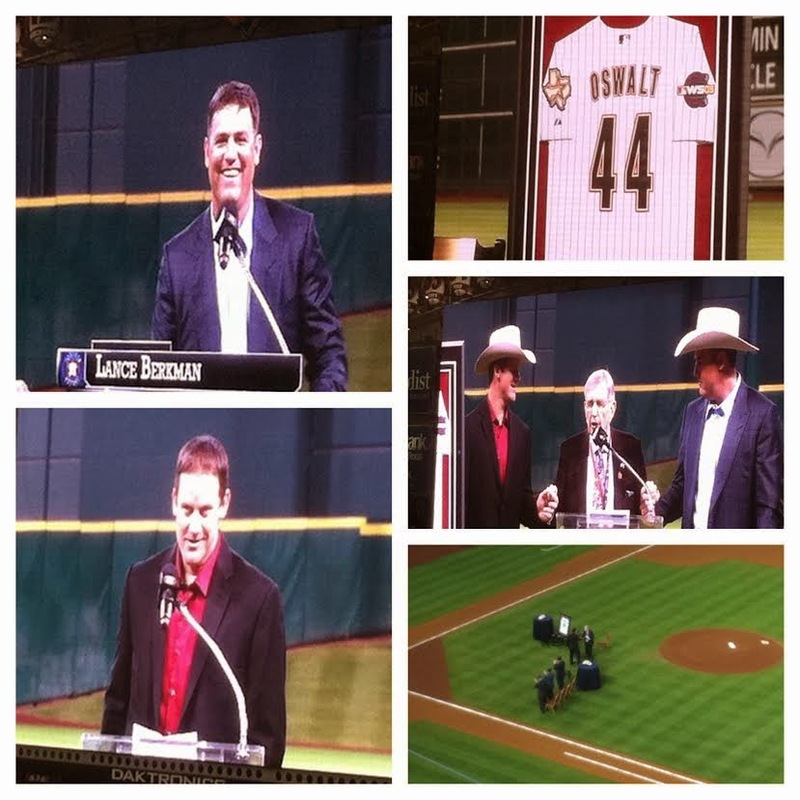 So this weekend I went to Saturday's game against the Angels with my friends Lenny, Christy, and Caleb, and it was super extra special when, no Brad Ausmus was not there and did not declare his undying love to me, but yes I got to see Berkman and Oswalt retire their jerseys as Astros. After the ceremony, Christy and I decided to wander off and get some grub. 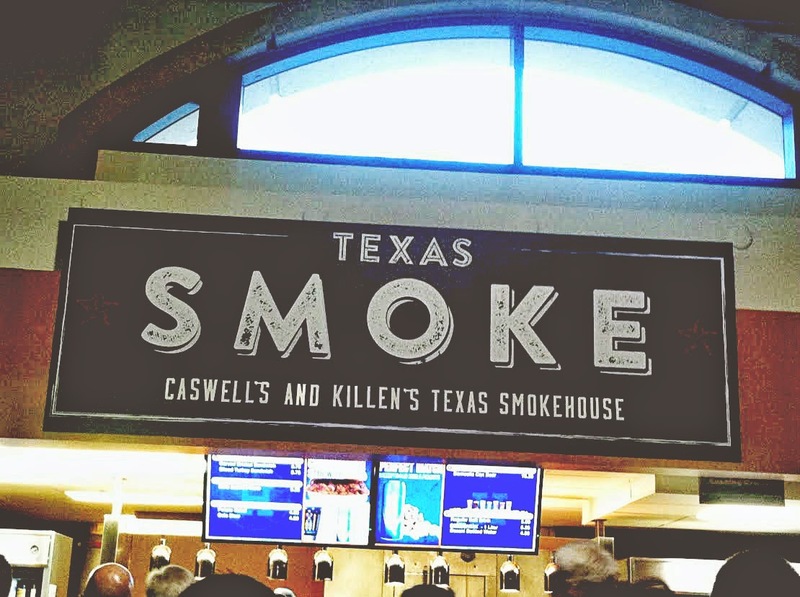 I have yet to experience the infamous magic of Killen's Barbecue, so we stood in line for half an hour at the new Caswell's and Killen's Smokehouse stand in Minute Maid Park. 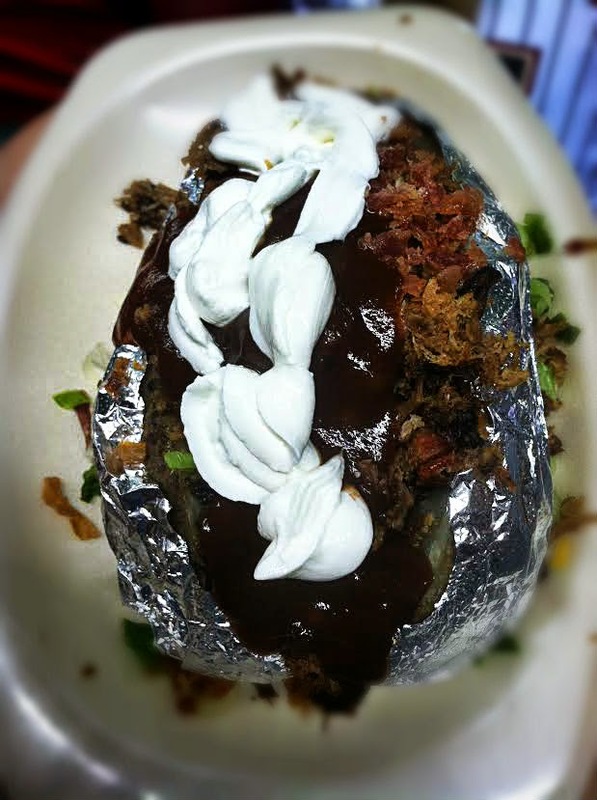 Did the luscious barbecue baked potato I ordered justify the long wait? You bet your cute little faces it did! Funny story about this picture though. I sat down in my seat, put the baker in my lap, leaned over to grab my phone out of my purse so I could take said picture, sat back up, and discovered that my entire upper lady bits were completely covered in barbecue sauce. And I was wearing a light blue shirt. And of course I was tempted to channel my inner Barney Stinson and take my friends up on their challenge of seeing how many dudes' numbers I could get while covered in barbecue sauce. However, after I finished eating that heavenly monster potato (look, a girl's got priorities), I went to the bathroom and performed soap and water surgery on my poor shirt. I came back to my seat, wearing a now soaking wet shirt mind you (I was totally that girl), but now barbecue-free, much to the disappointment of my friends. A few innings later, and my shirt was totally dry. But then! A fly ball suddenly popped over into our section and landed in someone's popcorn bucket five seats away from us. My now dry shirt became completely covered in beer as Christy flailed about trying to protect her face. I must have smelled AMAZING. After the game (Did we win, my parents asked me? I think we all know the answer to that question. ), we walked to the downtown bars, which I actually had never been to. I eventually want to do individual posts about each of these bars when I've had a more, uh, clear experience with them, but I'll give a brief overview. 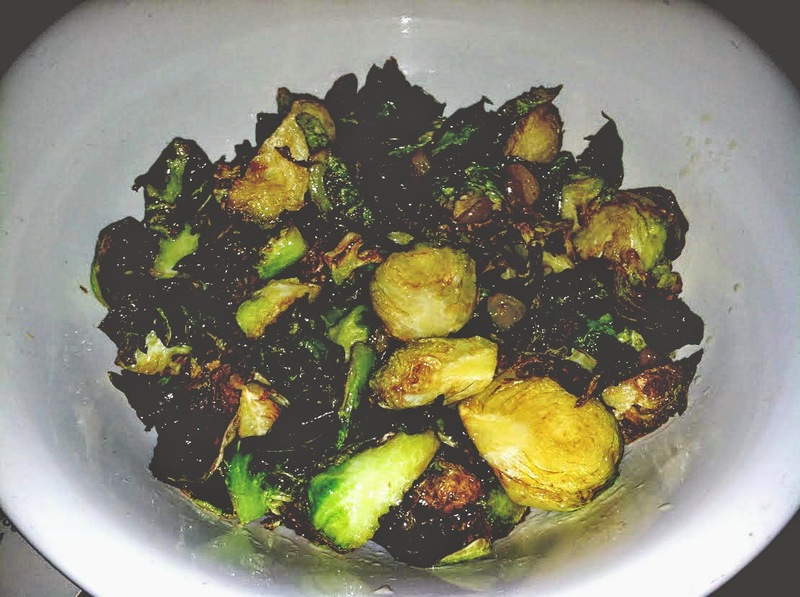 Our first stop was The Pastry War, and it was super adorable and super fun. Our last stop (well my last stop) was Captain Foxheart's (Bad News Bar), which 100% reminded me of a cool NYC Speakeasy. And side note, when we got in there Lenny asked me what my Twitter handle was, and I full on lied to his face and promptly told him it was @VodkaSoda (It's not. It's @kimmyog). 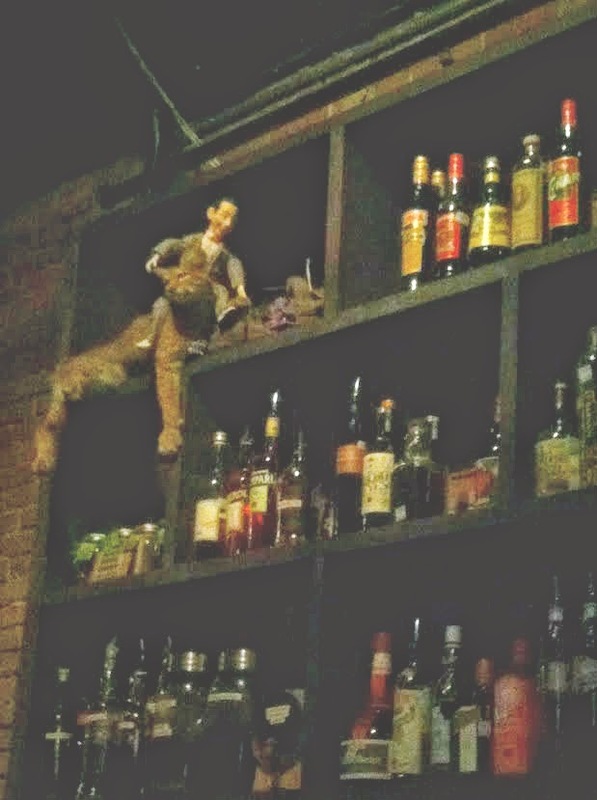 Is that a Pee Wee Herman puppet riding a taxidermed coyote? Yup, sure is. 3) I asked the beyond friendly bartenders if they would play "Africa" by Toto over their sound system, and THEY DID, and I became that totally *ahem*sober girl with beer and remnants of barbecue on her shirt, dancing alone in the bar, fulfilling my every dream. 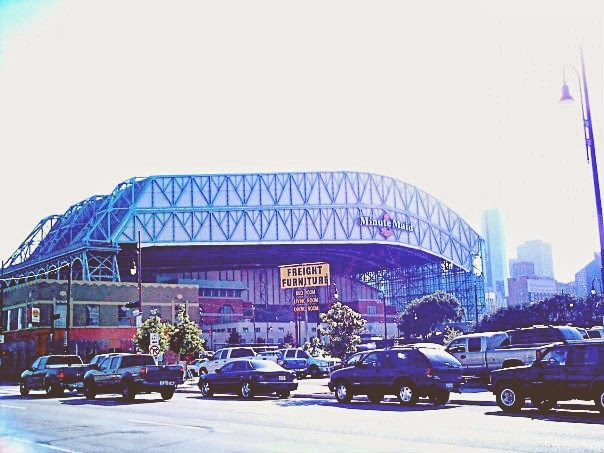 So long story long, Astros games are one of my favorite spring/summertime events to attend in Houston. You can get decent seats for not a whole lot, and now I've discovered that the after party downtown bar scene ROCKS. 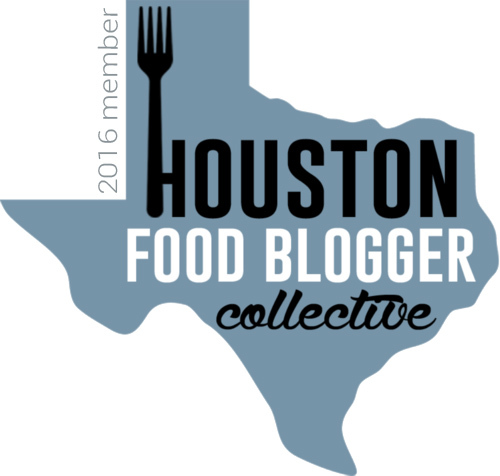 You should totally go! I'll even let you borrow my lucky shirt.